Statement by Honda Malaysia Sdn. Bhd. 7 October 2016 – Honda Malaysia today continues to assure customers of its commitment and ongoing measures to ensure the safety of customers by extending the operation of its hubs for Takata airbag inflator replacement activities. Honda Malaysia would like to thank all customers for their kind patience and understanding on the inconvenience caused by the Takata front airbag inflator replacement. Honda Malaysia would like to announce that the operations of the temporary Service Central Hubs for Takata airbag inflator replacement will be extended until 31 December 2016. With the opening of the temporary Service Central Hubs to support the service capacity of the Takata front airbag inflator replacement activities, the Central Hub completed 4,200 units, while the Northern Hub and Southern Hub completed 3,200 units and 3,800 units of Takata front airbag replacement respectively for the period of 1 August 2016 – 30 September 2016. Based on Honda Malaysia’s record on affected Honda vehicles, the Central region has the highest number of vehicles that have not replaced the Takata front airbag inflators with 23% compared to the Northern and Southern regions which is 9% and 8% respectively. As such, Honda Malaysia urges affected Honda customers especially in the Central region to make an appointment to replace the affected Takata driver front airbag inflators as soon as possible. 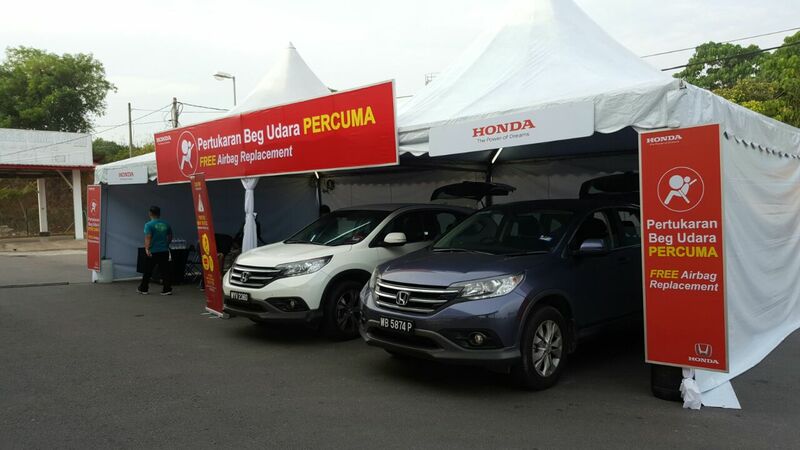 In view of the high number of affected Honda vehicles in the Central region that have not replaced the Takata front airbag inflators, Honda Malaysia is also expanding its Mobile Hubs to shopping malls in the Central region. Honda Malaysia would like to make available this service of on-the-spot replacement at the malls to make it easier for affected customers to change their affected Takata front airbag inflators. These Mobile Hubs in malls will be operational on Saturdays and Sundays from 10:00 am to 7:00 pm and will be located at identified shopping malls in the Klang Valley area. 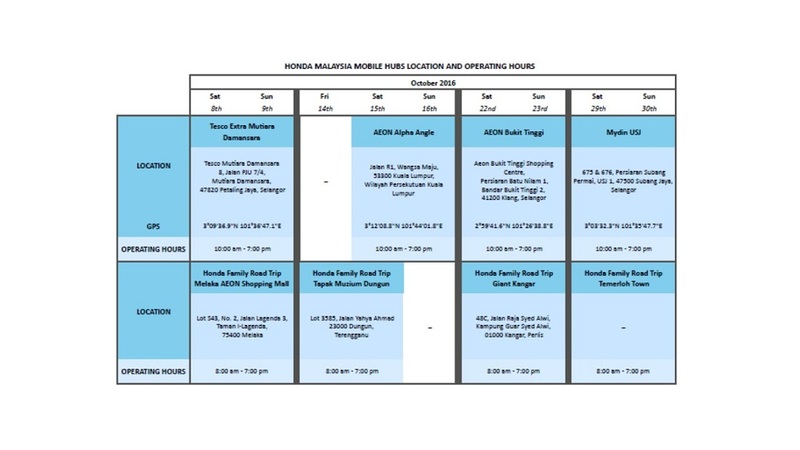 The original Honda Malaysia Statement contains and Appendix listing the locations of Service Central Hubs, Mobile Hubs and the operating hours for the month of October 2016. But for the convenience of readers, we insert that Appendix into this article below. During the period of 1 August 2016 – 30 September 2016, Honda Malaysia managed to replace more than 62,200 units of Takata front airbag inflators, in which about 11,300 units were replaced at the temporary service hubs. As announced in August 2016, Honda Malaysia have secured 100% of Takata driver front airbag and continues to urge affected customers, in particular those in the Central region to make an appointment with their preferred Honda authorised dealers or Central Hub, or visit the Mobile Hubs to have their affected airbag inflators replaced. Honda Malaysia would also like to update that parts for Takata passenger front airbag inflators are gradually arriving and are expected to be at 55% by end of December 2016. Customers are encouraged to check the Takata passenger front airbag inflators stock availability status at www.honda.com.my or www.productrecall.honda.com.my. Notification letters will also be sent to inform customers on stock availability. Honda Malaysia sincerely apologises for not being able to secure 100% availability due to the global shortage of Takata passenger front airbag inflators. Honda Malaysia will continue to work diligently to ensure that there will be sufficient parts for Takata passenger front airbag inflator replacements. Customers of affected Honda vehicles can replace Takata driver and passenger (based on parts availability) front airbag inflators by making an appointment with any Honda authorised dealers. Honda Malaysia also encourage customers to call the Honda Toll Free number 1-800-88-2020 to make an appointment with Central Hub. Honda customers can check their vehicles recall status either by logging on to www.honda.com.my or www.productrecall.honda.com.my or by calling the Honda Toll Free number 1-800-88-2020. 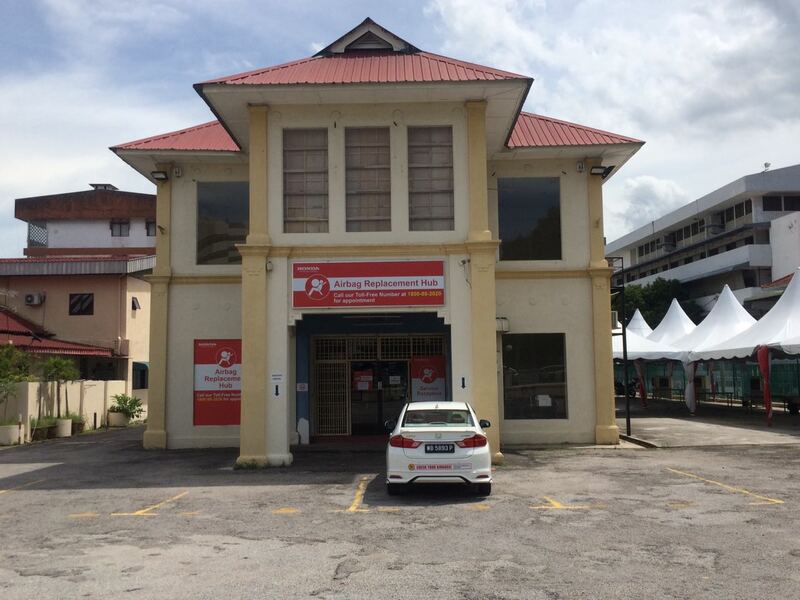 Honda Malaysia Sdn. Bhd. continues alerting and informing customers of the importance of replacing the affected vehicle’s airbag inflators, via increased frequency of postings on social media and SMS blast. Owners of Honda vehicles affected by the airbag inflator product recall are advised to get their vehicles checked and parts replaced at any authorized Honda dealers, Central Hubs or Mobile Hubs as soon as possible.